The high performance luminaire is designed for applications where long life, low maintenance, and consistent color rendering is required. The adjustable yoke, 2-3/8” tenon mount adaptor, or wall mount bracket allows for a wide range of mounting options and optimal light control. 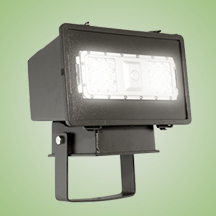 The fixture can be ground, wall, or pole mounted making it versatile enough for commercial, industrial, or residential lighting applications. Made with a state of the art UV stabilized acrylic high performance refractive optical assemblies that use high transmicity materials to achieve precise photometric distributions. Available in Type II, III, IV, V Medium and V Wide beam configurations. Standard mounting options include an adjustable yoke mount. Tenon, tree base, and wall mount brackets are available separately. Additional mounting options may be available for custom applications.